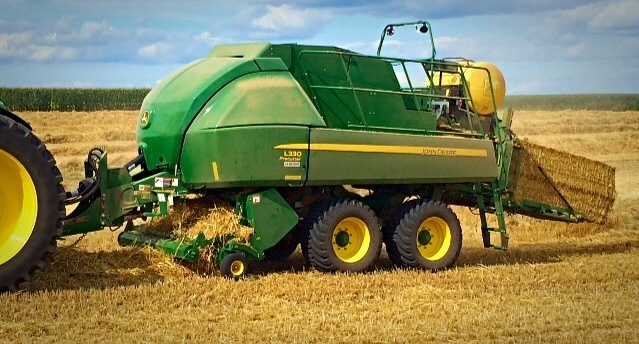 John Deere has once again joined the large square baler market, with two models available for shipment this year. These new balers are numbered L330 which makes a 3’x3’ sized bale, and L340 which makes a 3’x4’ bale. The L300 series balers are double tie balers, holding the bale together with a set of knots at each end of the bale. 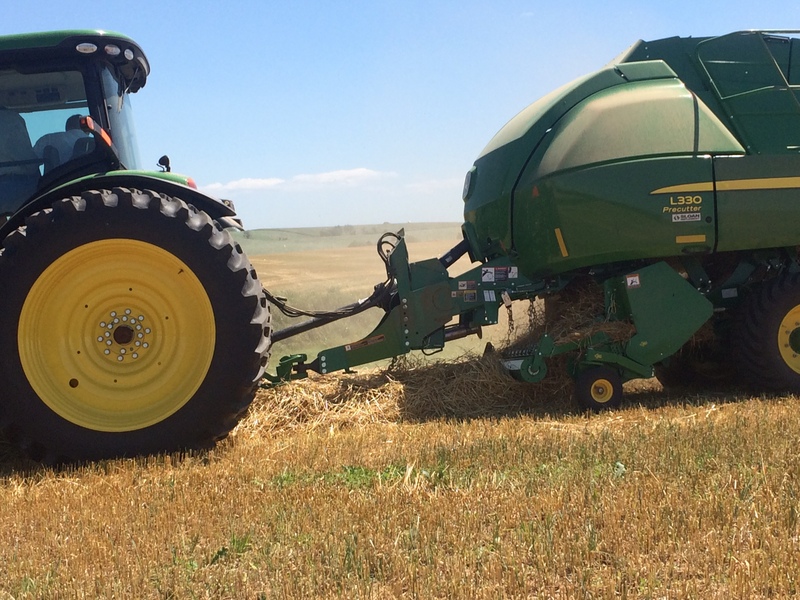 The L330 has four knotters, while the larger L340 has six to accommodate the wider bale. Both models can be ordered with pre-cutters, but must be done out of the factory. Pre-cutters are a set of knives that can be raised and lowered inside the baler’s throat to cut and size the crop for easier bale break up. Some of you may remember the John Deere 100 balers, and these are more than likely not pleasant memories. Well, we can finally put those nightmares to rest, because these balers are completely redesigned. You may have heard that these are just a Kuhn baler painted green. Well, that is only about 15% true. 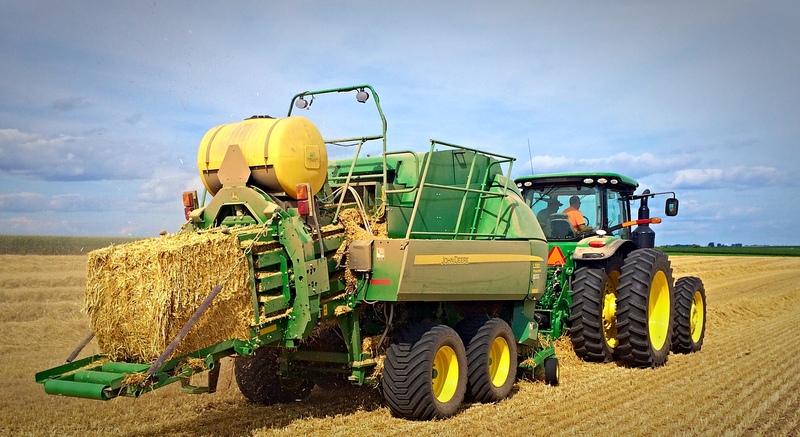 Deere did indeed purchase the patents from Kuhn on their baler, but 85% of the parts have been reengineered for added strength, increased reliability, and better longevity to meet the extreme baling demands in the United States. It is my understanding that the only parts of the baler that haven’t been changed are those dealing with the under carriage and axles of the baler. Sloan Implement was fortunate enough to take delivery of a demonstration machine for our Wisconsin stores at the end of July. 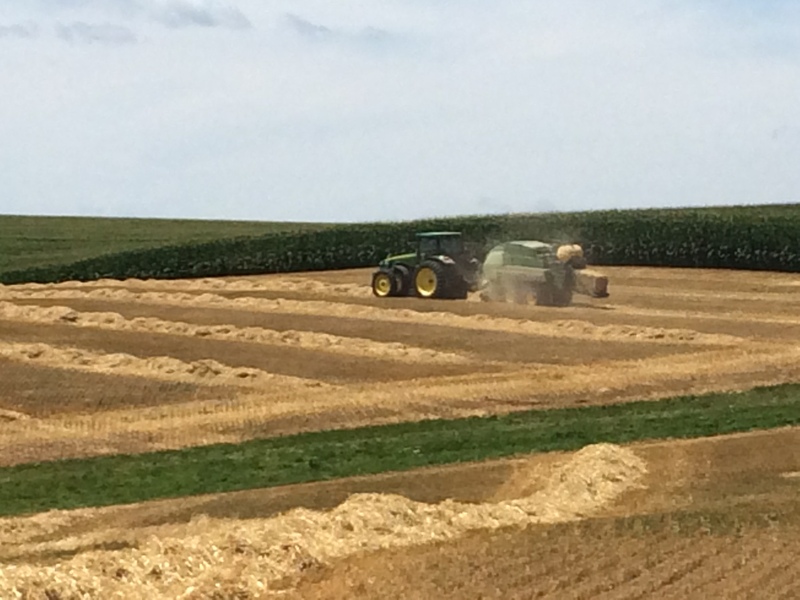 After a short pre-delivery inspection of the baler, we hit the small grain fields in our area to start baling straw. From the first demonstration through all subsequent demos, customers commented as to how easy it was to see the entire pick up from the tractor seat, how simple the monitor was to run, how “cool” the electronic flags on the display inside the cab were versus the mechanical knotter flags on the back of the baler (they show if there was a missed knot, which we have yet encounter with this baler), and also how dense and square-edged the bales were made. 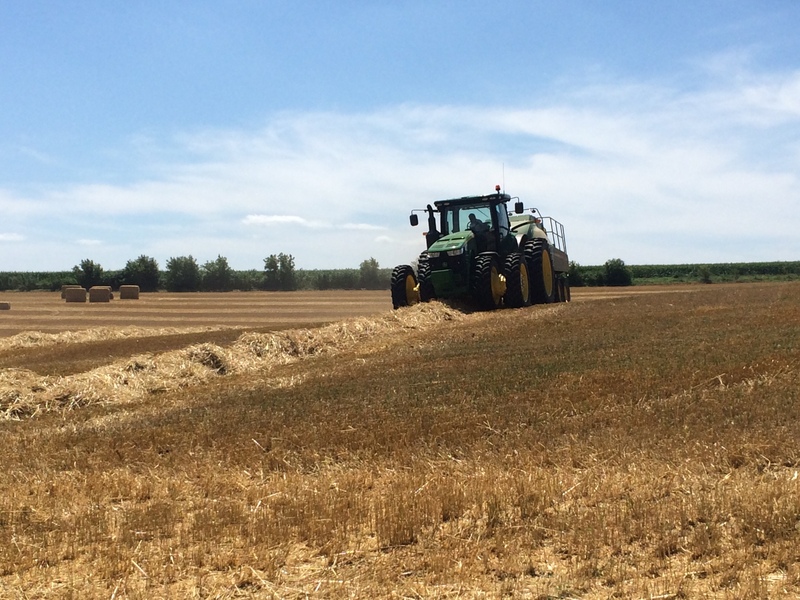 We have baled alongside of several Hesston, Massey Ferguson, Case IH, and even a Krone baler with very favorable results for the new John Deere. 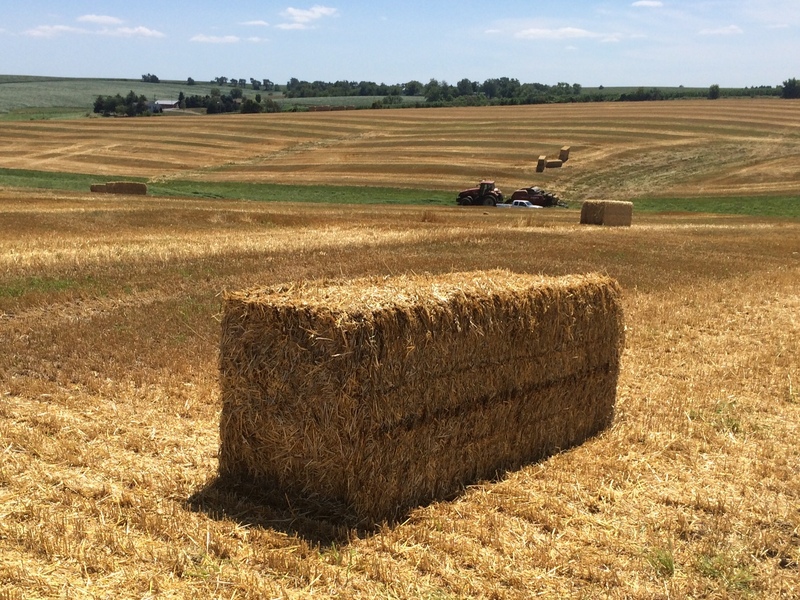 Customers have experimented with everything from an hour long race to see the baler’s capacity and a slow speed test to check for the most uniform bale flake, to weighing our bales against theirs. One could not ask for more appropriate validation as proof that this baler will be a baler that lasts in the marketplace. All in all, we have gone head-to-head with the competition, and customers have had a very positive response to the baler. If you are in or around Sloans northern stores and would like to see it in action, please contact one of your local AMS personnel or salesman to set up a demo. Here are some pictures from a few of our demos.